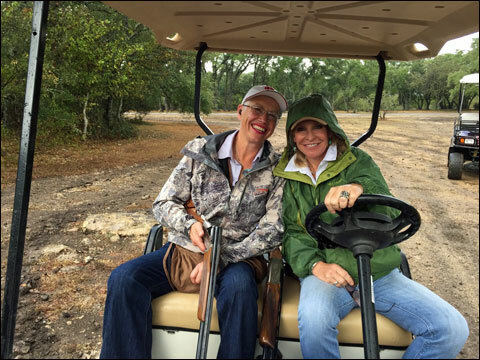 Even though Anne Kania is owner of the new wingshooting retreat and shooting academy for women called Joy of Hunting, she may in fact be one of the best relationship gurus for couples. That’s because women hunt for different reasons than men. 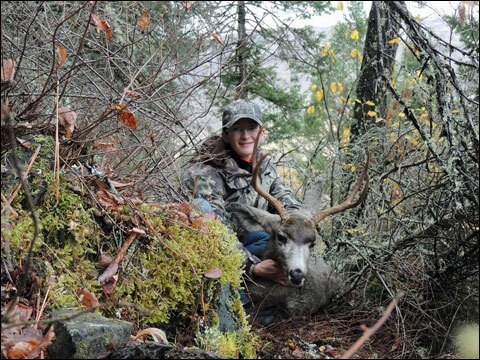 Stacy Keogh, Ph.D., who teaches in the Sociology Department of Whitworth University, has found in a study that women’s primary motivator for hunting is to nurture and build relationships with their families. 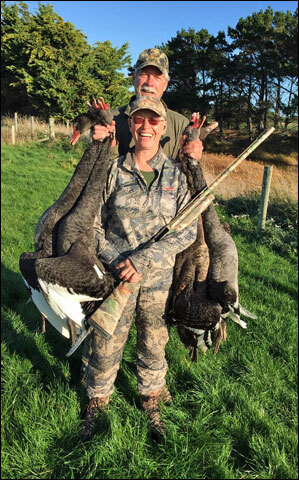 Ms. Kania and her husband, Bruce, recently started Joy of Hunting as a means of getting women safely in the field through one of the most accessible forms of hunting – game birds. She also believes that developing skilled female wingshooters results in a higher percentage of ethical, humane kills for table fare. As part of the wingshooting retreat and academy, the Joy of Hunting’s 4,000-square-foot house doubles as the comfortable lodge. It’s located on 340 acres in the historic Yellowstone Valley hamlet of Shepherd, Montana. Joy of Hunting is embossed on the West of Lewis & Clark, General George Armstrong Custer, the wild horses of Bighorn Canyon, the Pryor Mountains and Montana’s majestic Absaroka Beartooth Wilderness. Here in Big Sky territory, the Kanias have created a luxurious yet informal wingshooting adventure for all ladies regardless of hunting experience. The environment is ripe for success. The land has been cultivated to attract wild game birds − flatlands with drawers and river bottom managed for pheasants and wetland food lots and annual rotation crops for doves, geese and snipe. At the heart of the property is a preserve for wild pheasants. Although upland and waterfowl hunting are the mainstay, Ms. Kania and her team are perfectly willing to get you involved in deer and elk using a rifle or bow. She believes that the hunting experience can be transformational for women − providing they receive the training to ensure safety, success and confidence gained from the Joy of Hunting curriculum. Along with fellow instructor, Andrea Mahorney, their twofold guiding principles of the academy are Be Safe and Have Fun. 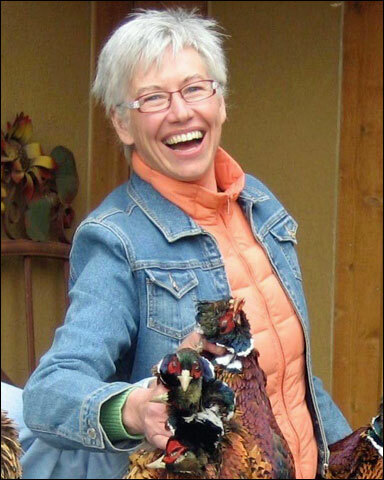 For Ms. Kania, wingshooting around Yellowstone Valley helped her feel at home with her new American husband when she arrived in the U.S from New Zealand in 2007. Originally from the Northeast of England, she graduated from Newcastle University with a degree in English. Afterwards, she moved to New Zealand where she worked as a training manager in a computer center and a professional classical singer. She also taught voice for many years, specializing in beginner adults and choral singers. In 2005 she met her husband. They managed a cross-Atlantic relationship for two years until she relocated to their house in Montana that he owned at the time. In the years following, Mr. Kania taught her to hunt, first starting on doves in the neighboring ranch. From there she set out on their pheasant preserve as well as wild waterfowl and even some big game in the surrounding area. Anne Kania in the field. Ms. Kania now believes that hunting with her husband enabled them to understand and appreciate each other better during the early years of their relationship. And if hunting could help the Kanias, then clearly it could help other women find a new outlet to become closer with their partners who hunted. She realized that her teaching background in high-tech and voice could be applied to empowering women in ways that aren’t always available. Her newfound dedication to hunting and passion for instructing led to her to qualify as a NSCA Level 1 Shooting Instructor in sporting clays – a discipline frequently used for training wingshooters. Anne Kania (left) with the Elizabeth Lanier of the G.R.I.T.S. 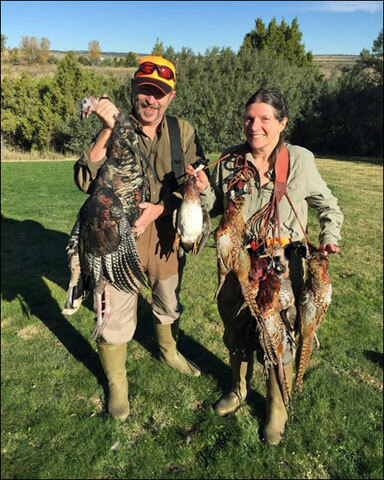 Joy of Hunting guests Dr. Paula Formosa and Dr. Michael Genoff. Mr. Kania, meanwhile, served as chef, hunter, game manager, dog handler and steward of their land. In setting up their pheasant operation, he flew to England and interviewed several gamekeepers on the tricks of the trade. His passion for the environment drives the entrepreneurial side of him through a company called Floating Island International that he started in 2005. It builds artificial wetlands islands that improve water quality. The Joy of Hunting’s hands-on courses provide year-round instruction and actual wingshooting during the season. Ms. Kania also offers a Couples Weekend for hunters with some basic wingshooting experience. 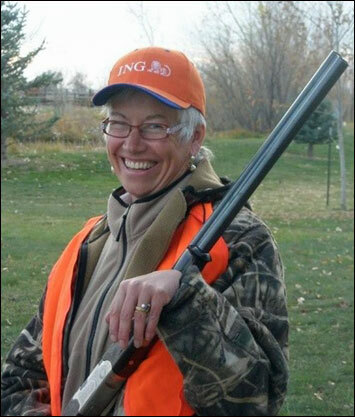 Ms. Kania says that, given the way women learn, the instruction techniques at Joy of Hunting encourages lots of questions in an informal atmosphere. “We want to provide an experience that teaches women to hunt, but also creates friendships that can last a lifetime,” she said.